UPDATE NOVEMBER 30, 2018 – 5:00pm – We’ve finished all our receiving for today and several Black Friday titles have (finally) arrived. We’ve updated the table further down the page to now reflect what we have in stock and what has sold out. We will not be updating this page again so please get in touch with us if you have question on inventory. UPDATE NOVEMBER 23, 2018 – 2:00pm – A handful of releases arrived and are now available, check the table further down this page. We expect more to come in next week. Please get in touch with us if you are looking for a certain release that we have on order. UPDATE NOVEMBER 22, 2018 – 10:00am – The majority of Black Friday exclusive releases we have ordered will be arriving late and won’t be available when we first open tomorrow. We should receive some in the afternoon tomorrow (Friday November 23rd) so please keep an eye on this page for more updates on availability on specific titles. There’s a handy table further down this page. It’s nearly that time of year when our friends to the south go a little wild on Friday. Up here we take a little more subdued approach to the madness that can be Black Friday. Here are the details for our “Backbeat Black Friday… and Saturday and Sunday Sale”. 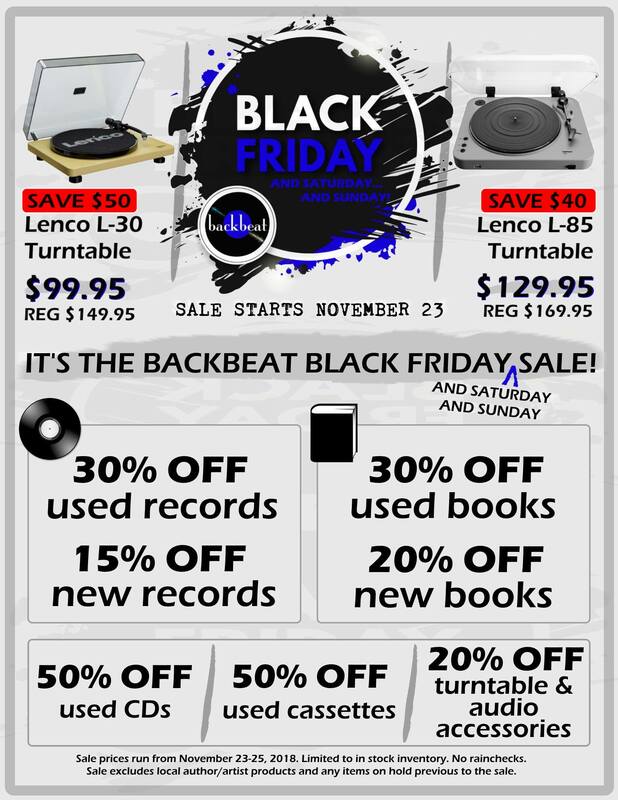 We just introduced the Lenco turntables and this weekend you can pick one up at an amazing price! Also, we’ll have a good selection of Record Store Day Black Friday releases that are exclusive to indie record shops like us. Forget the big box shops and online shopping, come get something unique that you can’t find everywhere. Check out the list of Record Store Day Black Friday releases we have ordered a little further down this post. Sale prices run from November 23-25, 2018. Limited to in stock inventory. No rainchecks. Sale excludes local author/artist products on consignment and any items previously on hold. Here’s the list of Record Store Day Black Friday exclusive releases we’ve ordered. We’ll update the list once we’ve received stock to show that it will be available starting Friday November 23rd at 10am right here at Backbeat. There may be a few items not on the list that arrive so it’s best to come on down and check it out. Any quantity you see is not what we have on hand it is what we received so please get in touch to ensure we still have stock. YES (1) $19.95 Toto Hash Pipe 7"